This sleep tight teddy blanket is a beautiful blanket full of texture and adorable teddy bears. The teddy bears are all snuggled and tucked in for the night with their sleepy eyes and paws just wrapped over the blankets edge. 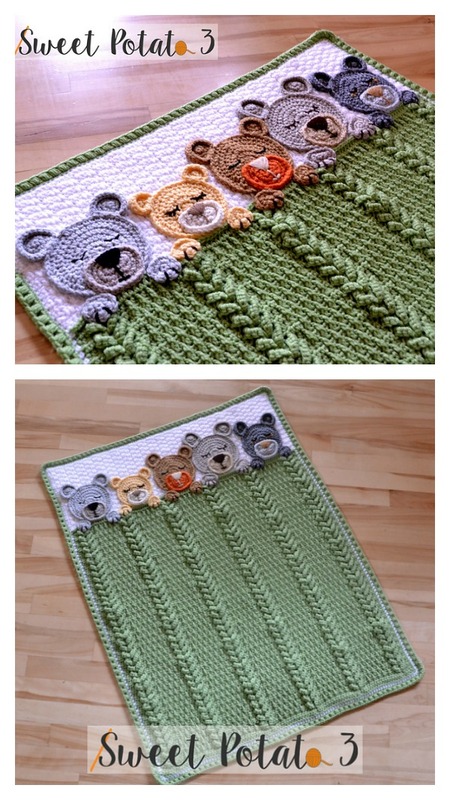 The Sleep Tight Teddy Bear Baby Blanket Crochet Pattern has a photo tutorial and a link to video tutorial for the beautiful braided “V” stitch. It’s easy to follow. The blanket is made from the bottom up. This is the perfect gift for a newborn or small children. Thanks Sweet Potato 3 for sharing this cute project. The link for more detail is provided below photo. Happy crocheting.